An innovative partnership involving a range of organisations across Birmingham and Solihull has secured £9.72m* of National Lottery funding from Sport England to deliver Active Communities a new vision to tackle physical inactivity in Birmingham and Solihull, reaching the population of over 450,000 people. The Active Communities partnership is being jointly led by The Active Well Being Society (TAWS) – a mutual benefit society that works to improve the lives and well-being of residents across the local area and Solihull Council. It aims to work collaboratively with local organisations, volunteers and local people to help improve the quality of life of some of the most vulnerable in the community. The Local Community Action Networks will design and lead on activities such as local festivals, with the support and guidance from a dedicated officer. Physical inactivity is the fourth leading cause of premature deaths in the UK and costs the country an estimate £7.4 billion a year. The Active Communities pilot in Birmingham and Solihull is one of 12 Sport England National Lottery funded Local Delivery Pilots, an innovative new approach to build healthier, more active communities in England and tackle the barriers in communities that stop people from getting active head on. By focusing intensively in six areas, The Active Communities team and their local partners are working with residents, looking at what stops them being active and working out ways to deal with these barriers. A further five will be appointed in the next six months, with the first to border both Birmingham and Solihull currently being advertised. 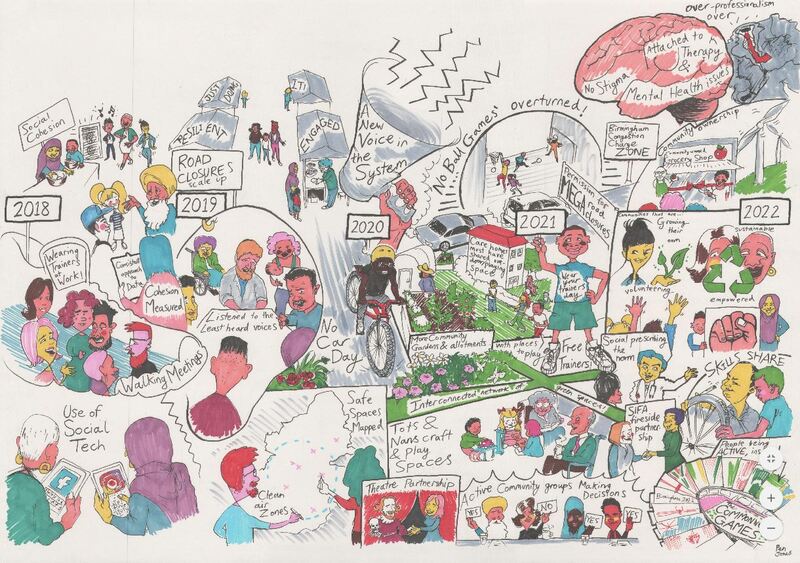 Growing a community ‘crowd’ of 100,000 people – to have a collective voice and provide an online platform helping local people to connect, communicate, collaborate and take part in physical activity. Active Communities is encouraging everyone across the subregion to join this social movement by signing up to the ‘crowd’. Members of the ‘crowd’ will be kept up to date with progress in their area, be sent news on free sport, social or civic activities and events, and will get the chance to vote on their priorities and connect with local people and opportunities. Free activities designed and tailored by local people – for example traffic free events enabling people to be active and come together with friends and neighbours; free activities in parks/open spaces; learn to ride courses and beginner bike rides in the local communities with access to bikes for adults and children, walks and running groups. Social prescribing – working with local GP’s so they can refer patients onto social, civic and sports programmes, such as photography, gardening, and creative arts, with physical activity being introduced slowly and gently to people who aren’t used to being active. The Welcome – giving existing and new staff delivering activities the skills to mentor participants to encourage them to keep coming to sessions, to build friendships and build confidence in groups to identify the next community leaders to make activities sustainable. Employing the right local people to work with communities who people can identify with and trust. Sharing in common – physical and mobile hubs or centres for the local community to come together, share tools, sports equipment, DIY items, gardening equipment and toys, helping to foster trust. Reclaiming the Wilds – bringing wild or overrun green spaces back into practical use for the community, for arts, growing, sports or social spaces. Providing people who live in urban areas with a chance to reconnect with nature on their doorstep and make the space around them more useable instilling a sense of local pride. Festivals Shaped and organised by local people to celebrate the great work of volunteers and to create a place for communities to come together. “As Birmingham Council we are very proud of this initiative and very pleased that Sport England and National Lottery have both recognised the great progress we had made on this already, as well as see the potential that we can see to make the city and Solihull even better places for people to live and be active in. We know that the poorer you are, the more likely you are to experience barriers to be active, that’s physically active but also active in your city and local community. In the council we are committed to working differently to change things, to ensure we are working with our communities to change things for the better, rather than continuing to do what has always been done and clearly, in some ways, isn’t working for those in the most need. “I am delighted that Sport England has chosen our joint bid with Birmingham as one of the 12 pilot areas. This is very good news, not only for people living in those areas of Solihull, but for the whole borough. Creating the conditions for communities to thrive is a Council priority. The Active Communities pilot will help us to do this in an innovative way and learn how we can use sport and physical activity to bring people and communities together. “As a nation we need to break down the barriers people face in getting active. A major part of this can be bringing local people and organisations together which is critical to the approach of the Local Delivery Pilots. We are delighted to award National Lottery funding to the Active Communities Pilot which aims to empower Birmingham and Solihull residents to lead the change in boosting activity levels. Anyone interested in getting involved or finding out more should email the team via activecommunities@theaws.org, visit the Active Communities website and join the ‘Crowd’ or call them on 0121 728 7030.